Scientists often use the combined power of multiple telescopes to reveal the secrets of the Universe – and this image is a prime example of when this technique is strikingly effective. The yellow-hued object at the center of the frame is an elliptical galaxy known as Hercules A, seen by the Earth-orbiting NASA/ESA Hubble Space Telescope. In normal light, an observer would only see this object floating in the inky blackness of space. However, view Hercules A with a radio telescope, and the entire region is completely transformed. Stunning red–pink jets of material can be seen billowing outwards from the galaxy – jets that are completely invisible in visible light. They are shown here as seen by the Karl G. Jansky Very Large Array radio observatory in New Mexico, USA. These radio observations were combined with the Hubble visible-light data obtained with the Wide Field Camera 3 to create this striking composite. 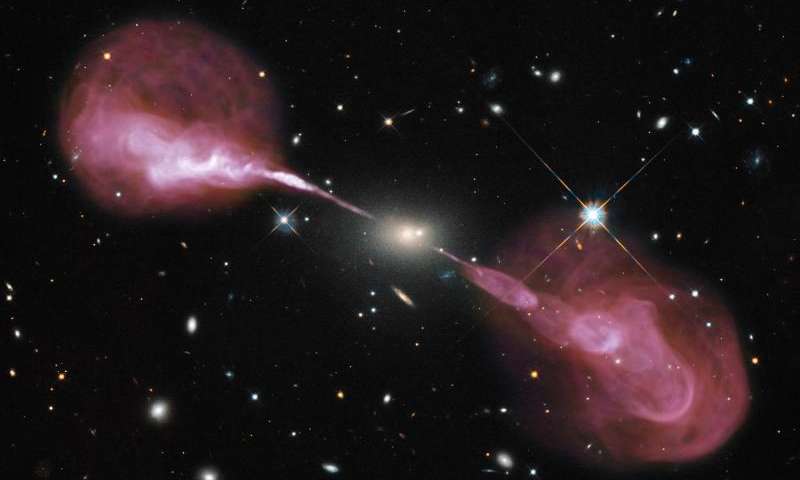 The two jets are composed of hot, high-energy plasma that has been flung from the center of Hercules A, a process that is driven by a supermassive black hole lurking at the galaxy’s heart. This black hole is some 2.5 billion times the mass of the Sun, and around a thousand times more massive than the black hole at the center of our Milky Way galaxy. Hercules A’s black hole heats material and accelerates it to nearly the speed of light, sending it flying out into space at phenomenally high speeds. These highly focused jets lose energy as they travel, eventually slowing down and spreading out to form the cloud-like lobes seen here. The multiple bright rings and knots seen within these lobes suggest that the black hole has sent out numerous successive bursts of material over the course of its history. The jets stretch for around 1.5 million light-years – roughly 15 times the size of the Milky Way. Hercules A, also known as 3C 348, lies around two billion light-years away. It is one of the brightest sources of radio emission outside our Galaxy.